Impact Wrestling has announced who will induct Abyss into the 2018 class of their Hall of Fame. On Thursday night, the promotion revealed that James Mitchell will do the honors. The TNA Original will be celebrated and honored for his contributions to Impact Wrestling this weekend. The ceremony will take place on Saturday, October 13th in New York City at McHale’s Pub. He’s a former World Champion, X-Division Champion, and World Tag Team Champion. He joins Kurt Angle, Sting, Jeff Jarrett, Gail Kim, Earl Hebner, and Team 3D as members of the Hall of Fame. The pre-show will air on Twitch at 7:30PM ET that will see stars of the roster arrive while the Hall of Fame ceremony will begin at 8PM ET. Fans who purchased VIP Tickets for Bound For Glory will be invited to attend the Induction Ceremony the night before Bound For Glory. Also, tickets are available as well, it will be a limited engagement. 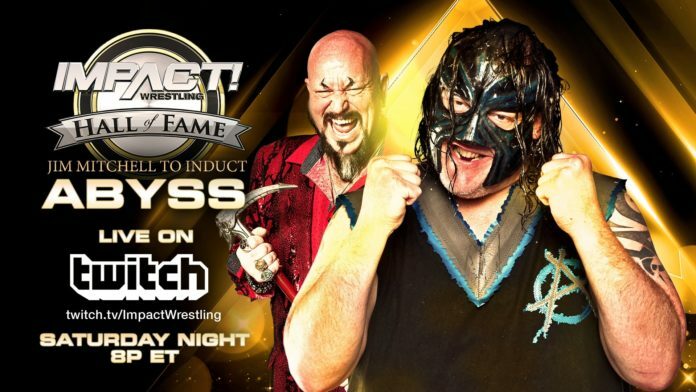 BREAKING: Father James Mitchell will induct @TherealAbyss into the IMPACT Hall of Fame as it streams TOMORROW live on Twitch. As of this writing, Abyss doesn’t have a match lined up for the biggest pay-per-view event of the year for Impact Wrestling, which is Bound For Glory, but with only six matches advertised to take place, it’s possible that they can book him in a match that would follow up his induction night.